Retail $245.00 SAVE 44% ! This is a good beginner kit for someone just wanting to get into the hobby. The kit comes with Bachmanns E-Z track which is only really compatible with said E-Z track. It does allow for the track to be set up for a short period of time and then put away for someone who cant keep a permanent layout. The set is DC, so any extra engines you get need to also be DC. 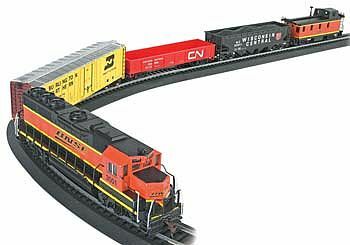 A 47" x 38" oval layout of snap-fit E-Z Track with stee rails on molded black roadbed. "My Thoughts on Bachmann&apos;s Rail Chief Train Set"
I was pleased with the simplicity of this set&apos;s speed changer, with the quality of the engine&apos;s paint job, and with the cheap price of this set. Not only did I get the train, three cars, and a caboose; but I also received a circle of track and packets of passengers, signs, telephone poles, and a signal bridge. The train itself can move at varying speeds both forwards and backwards. The only problems I have seen with this set are loose wheels on the cars and springs popping off the knuckle couplers. Both of these problems, I believe can be avoided with gentle treatment. Overall, this set is perfect for beginners and experienced railroaders alike. When you&apos;re starting from scratch, Bachmann&apos;s Rail Chief is a great way to go. The GP 40 included in this ready-to-run set is one of the best performing HO locomotives I have ever owned. The set includes everything you will need to start enjoying this fantastic model railroading hobby.